These data seem remarkable to me for two reasons. First, those favoring legalizing at least small amounts of pot outnumber outright prohibitionists by a wide margin (42-27). 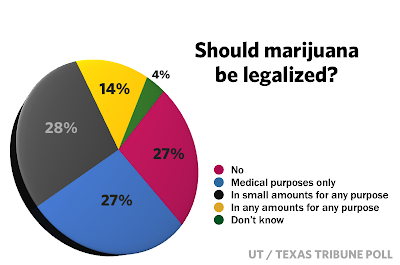 And combined with those favoring broader legalization, 69% of Texans favor legalizing medical marijuana, according to this poll. I wouldn't have expected either of those results. One wonders what sort of seismic political shift would be required for Texas' policies to match the preferences of its voters? Ha, I think it would take a divine intervention kind of thing atm. But eventually, it'll happen. Cities like Austin will lead the way. Counties like wilco will fight to the bitter end, especially when the feds start bribing (yes, I said 'bribing', 'cause that's what it is) the leos to enforce anti maryjane agendas. But they'll lose eventually. Starve the criminals of their cash cow and free the Bill of Rights from the LEOs! End the Drug War and legalize pot. Texas is one of the most restricted police state in this country. Its not a State of the people , Its a corporate close minded directorship. This was one of the first states to make pot illegal and they wont budge. Makes me sick and Wish i could go down the street and buy some pot for my anxiety and depression and Bi polar disorders. But no I can't find any , guess ill keep drinking myself to death . when i have pot i dont drink but i'm going on my fifth day of hard booze and might even loose my job due to hangovers , Who cares! i want to die anyway. So i hope i never get pot because that's a good thing in my life and i don't need happiness. Some may say get on medication , Have you seen what theses psychoactive drugs do to your brain ! Put in simple terms its a chemical lobotomy wit loads of it own problems! As a NORML legal committee member I can't tell you how exiting is to see Texans embrace cannabis reform. I'd encourage everyone to contact their pol, and tell them about this poll. 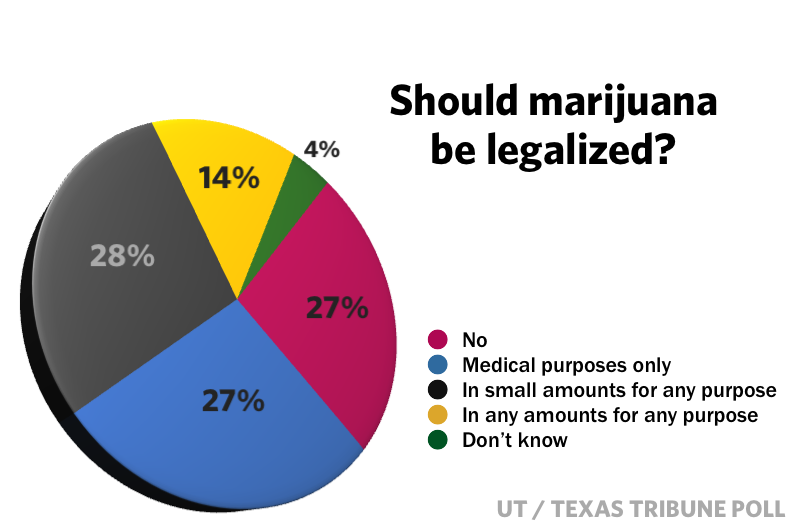 Texans understand that our cannabis laws are inane and immoral. Now we just have to convince the political class. You staties think of the money Texas could SAVE on prosecutions and jail space and the money that could be MADE, (for Education! The Children!) on taxing the stuff. Plus the Mexican cartels don't need all the money. If we legalized it and told the feds to get lost. So many options on the poll. I expect a constitutional refererendum for medical use only would pass. I doubt straight out legalization would. What kind of seismic event, you ask? I suspect a hurricane would need to spray Deepwater Horizon oil all over the Capitol before the Legislature will legalize pot for any purpose. The "war on drugs" has been a complete failure. We should declare victory and declare war on something else. Great site. Its a nice blog posted by you. I was seeking for this type of blog that have a fresh and interesting content. Thanks for this post.I enjoyed reading it.It has really changed the way I think about this. Funny, I got a haircut at a South Austin barbershop this afternoon and had this very discussion with my barber. I'm a defense lawyer and on NORML's Legal Committee. My initial thought is that the poll surprises me- I would have assumed those numbers in Austin but not statewide. I could envision Austin doing some city proposition making pot cases a low priority (they have already begun doing cite-and-release instead of taking every arrestee to jail on POM cases). Similar to Boulder's recent initiatives, or Breckenbidge or Aspen. The tide is definitely moving, but I feel like Texas as a whole is still too Conservative, with too many people profiting off of the drug war, for things to move too quickly.